I would love to offer you a 20% discount on one of my select online workshops! Start creating today! 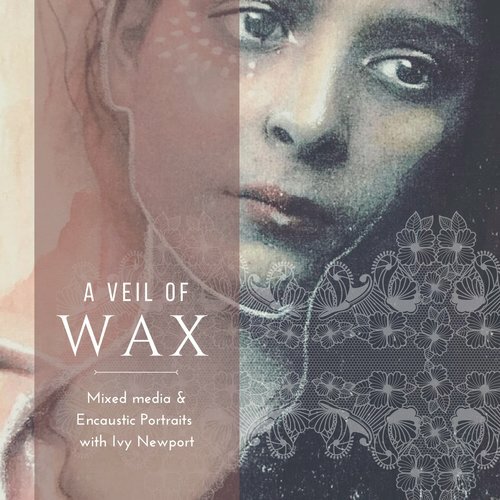 I'm delighted to bring you this class where we explore the beautiful combination of luminous encaustic wax and portraits! Whether you are looking to combine photography, collage or your mixed media paintings with wax - this is the class for you - as I will guide you through all these processes. Sometimes the most striking portraits are not about color or polish but about expression, line work, contrast and emotion. Sometimes using less materials equals MORE impact! Join me for this mini-portrait class where we will explore some of my favorite tools, tricks and tips for creating evocative, expressive portraits - including painting and drawing with BOTH hands! Degas has always been one of my favorite artists. Occasionally, one of his ballet dancers will cross my path and each time I am taken with the beauty, grace and color he captures. So, finally I have decided to dive deep into a study of his work and blend this knowledge with my own passion for figurative and mixed media art. Join Tricia Dewey and explore innovative techniques to creating unique, expressive and modern abstract figurative art on your iPad and iPhone! She's excited to share her techniques with you! We carry them with us at all times - we don’t leave home without them! So...why shouldn’t we be using them creatively too? You can make beautiful, rich art right on your iPhone! I am so excited to announce this class! It's something I've been working on for quite some time now. I've been studying landscapes, abstract and figurative work. One day, I sat down and they all came together. I knew right away, I had to share this process with you. I've teamed up with my dear friend and fellow teacher, Petra Hrziwnatzki to create this brand NEW Online workshop! Art and Poetry co-exist. Words and colors. Stanzas and brushstrokes. Verses and imagery. This is why we have created this class. We hope you will join us on this exciting artistic journey! I am delighted and honored to host a BRAND NEW class by artist Katrina Koltes! She will be sharing her inspiring process of creating mixed media paintings infused with magic, mystical creatures and enchanting stories! Come learn all of Katrina's gorgeous techniques and discover the magic within you! Register now! This two week online mixed media and encaustic workshop will explore the magic, grace and beauty of birds! We will be completing 4 main projects as well as several studies and exercises. These finished creations would make beautiful gifts for loved ones and friends too! I am delighted and honored to host a BRAND NEW class by artist Jeanne-Marie Webb! She will be sharing her inspiring process of creating mixed media portraits on tiny tea bags! An intricate and beautiful art indeed! This class has been long anticipated and we expect it to fill very quickly. Register now! Who doesn't adore the beauty, grace and strength of horses? They have captivated artists for centuries and have been depicted in all cultures! Well...my intention is not to teach you how to draw a horse perfectly - that could take years of practice! But to rather show you how to capture the essence of the Horse - your very own SPIRIT HORSE! Come join me and let's create together! Come join me for this one week Mixed Media & Encaustic workshop where we explore the beauty and subtlety of white and neutral tones. When we strip away color - texture, contrast and ultimately design and composition come to the forefront. We will focus on these artistic aesthetics as we complete three beautifully unique projects. Join me online in this mixed media workshop where we will be creating two elaborate projects - a whimsical portrait and a dreamy landscape! Don’t fret if you’ve never painted a face before – I have some great tricks to share with you! Our live class was a huge success so we've decided to open it back up as an self-study. What does that mean? Well, it means you will get all the wonderful content as our live students, access to our gorgeous, info packed classroom and a powerful connection to the Paint & Pixels community! Are you ready to learn how to create ART on your iPad? Come on in! I am delighted to introduce you to the wonderfully talented Petra Hrziwnatzki! I am so honored to have her here to share this beautiful class with you! Come join artist and storyteller, Robin Laws on a week long journey into the magical realm of storytelling and art! This unique mixed media class will focus on developing your storytelling voice so that you can create art that is compelling and rich with imagination!